Following explosive evidence at the Senate inquiry into foreign bribery this morning, Greens spokesperson for democracy Lee Rhiannon has called for the Liberal and the Labor parties to donate the value of their Leighton donations to support humanitarian relief in Iraq. 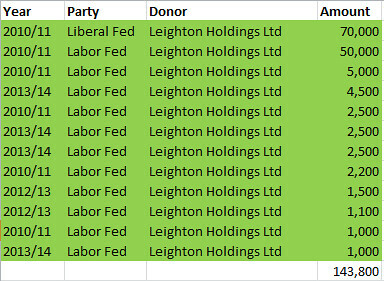 “From at least 2010 Leighton’s earnings are tainted with corruption and the pillage of post-invasion Iraq, as are the donations the Liberal and Labor parties have accepted. “There are serious allegations based on solid evidence that Leighton bribed Iraqi officials, using Unaoil or other middlemen, in order to win a share in oilfield contracts. “This morning a former Leighton executive testified to a Senate inquiry that ASIC intends to charge former Leighton finance chief Peter Gregg with false accounting offences over a suspect $15 million payment. “Mr Shorten has commented a number of times on the global bribery scandal and has called on the Prime Minister to condemn these multinationals. “Today we are calling on both major parties, who have accepted tens of thousands of dollars in donations from Leighton Holdings since 2010, to pay that money to an organisation supporting humanitarian efforts in Iraq like the Red Cross,” Senator Rhiannon said.